Founder Diane Formoso retired from the Clover Park School District in 2004. Diane had been a school bus driver since 1971. She started Caring For Kids when a kindergarten boy got on her bus wearing his mother’s high heeled boots because he had no shoes of his own. 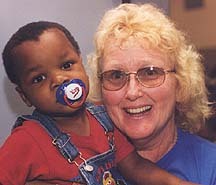 Diane works tirelessly to provide basic needs for the children of our communities.